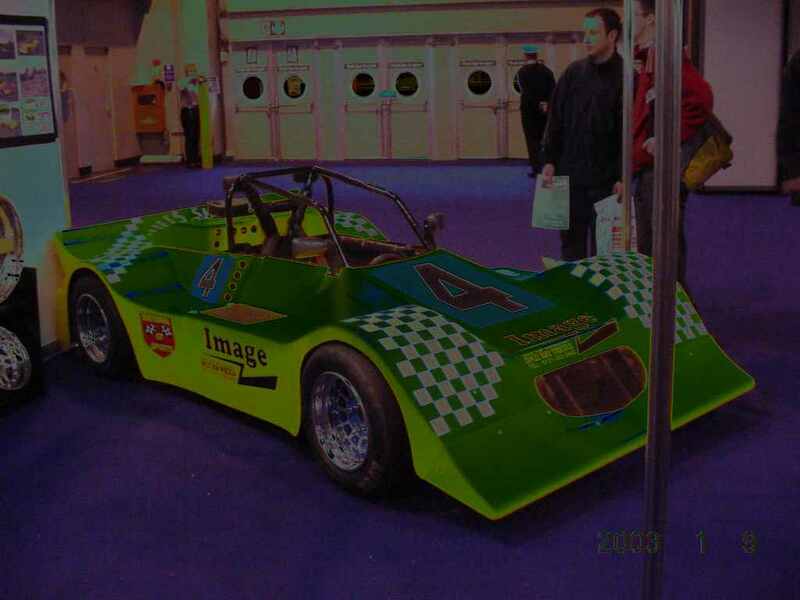 The pictures on this page were taken on Press Day at the 2003 Autosport Show. As the Oval Racing section opens only on the Saturday and Sunday (11 and 12 January) there was only a limited amount specifically of interest to short oval fans but there was still plenty to see and do. The expansion of the Engineering section has continued apace with the number of exhibitors rising to something like 400. Such growth over such a short space of time seems astonishing but is surely an indication of the rising importance of the motorsport industry. So as not to 'spoil' the experience of visitors to the Show many of the images taken will not be published until after the event has ended but rather on this page to concentrate on three aspects to the show which are directly of interest to oval fans. These are a newly launched INCARACE Academy based on a new car produced by Image Wheels, a new Motorsport Tourism Website and Map launched at the Show and last but no means least the BriSCA F1 Stock Cars that once again are a mainstay of the show in the Live Action Arena. Developed by Harry Nicklin of Image Wheels and Lightning Rod fame the Oval GT Sports car will be at the centre of the new INCARACE ACADEMY. The car is a brand new and attractive design developed over the past 18 months featuring plastic and Kevlar panels powered by standard (almost) 1600cc and 1200cc engines. There will be a Control Tyre to ensure even competition. The cost to get yourself on-track will be less than �5,000 and the kit costs from Image Wheels is �1800. For those going to the Autosport Show you can see the car and meet Hary Nicklin and his team on the Image Wheels Stand (8302 in Hall 8), close to the entrance to the Live Action Arena. This is a new website officially launched at the NEC to promote Motorsport and is accompanied by a UK Motorsport Map which locates major motorsport places and events. This is a major initiative by the Motorsports Industry Association (MIA) in association with the East Midlands Development Agency. The really important thing about this venture is that the inclusion of oval racing forms an integral part of the plans and you can do your bit by visiting the stand and registering on the site. As ever this features a wide variety of classes and attractions - including Jo Guest! - and any visit to the Show is incomplete without seeing at least some race cars turn wheels in anger. The BriSCA F1 Stock Cars once again feature as an anchor in the show and the race on Thursday's only running of the LAA featured John Lund, Frankie Wainman Senior, Peter Falding, Derek Fairhurst, Ivan Pritchard and Neil Scothern who won the race having started at the back!